Essentially speed humps that have been modified with a flat top, speed tables are asphalt or rubber mounds that cover the full width of the roadway. Speed tables are asphalt or rubber mounds that cover the full width of the roadway. Speed tables are essentially speed humps that have been modified with a flat top, thus reducing the disruption to vehicle operations. The flat top is typically long enough for the entire wheelbase of a passenger car to rest on. Speed table (Shauna Hallmark/Institute for Transportation). Speed tables are being preferred commonly over speed humps. This preference is due in large part to an emergency service vehicle’s ability to cross with minimal disruption. 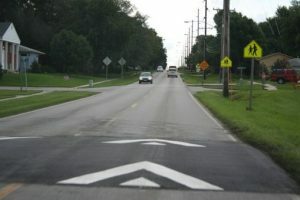 Cross-section of a flat-topped speed hump (SCDOT 2006). Speed tables were shown to produce a 28 percent change in 85th percentile speed, 15 percent change in average speed, and 28 percent decrease in auto collisions (Corkle et al. 2001). Average and 85th percentile speeds decreased at the location of the device by up to 9 miles per hour (mph) for the speed hump and 10 mph for the speed table (Hallmark et al. 2002). No crash modification factors (CMFs) were found relating to speed tables or speed humps. Speed tables and speed humps are appropriate when the design speed of the speed table or hump corresponds to the posted speed limit. Careful consideration should be given to farm vehicles and routes with a large number of heavy trucks. Installation cost, according to two separate sources, is $2,000 to $6,000 (Kastenhofer 1997, Hallmark et al. 2002). Hallmark, Shauna, Dan Smith, Keith Knapp, and Gary Thomas. Temporary Speed Hump Impact Evaluation. Center for Transportation Research and Education, Iowa State University, 2002. Kastenhofer, Elena Orban. Traffic Calming, the Helpful Band-Aid, in Virginia when the State DOT is 100+ Local DP. Presented at annual meeting of the Institute of Transportation Engineers, 1997. SCDOT. SCDOT Traffic Calming Guidelines. South Carolina Department of Transportation, Traffic Engineering, Columbia, SC, Revised 2006.